A Pakistani court has charged former President Pervez Musharraf with treason for implementing emergency rule and suspending the constitution in 2007. Musharraf has already been found guilty of the murder of former Prime Minister Benazir Bhutto. If convicted of the charges he could face the death penalty. Musharraf has pleaded not guilty and claims the charges are politically-motivated. Judge Tahira Safdar read out the five charges in the hearing which included treason for subverting the constitution and instituting emergency rule in Pakistan in 2007. 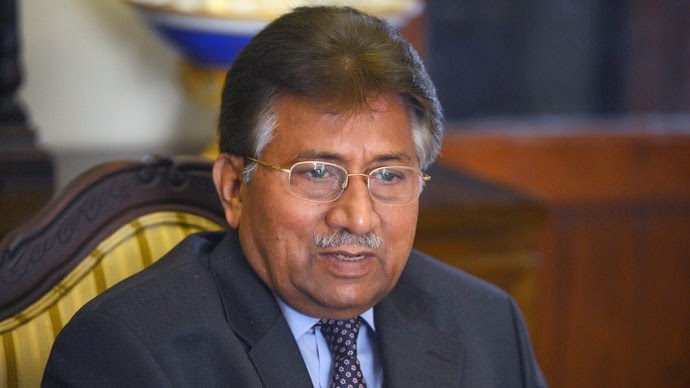 Musharraf defended himself in the court hearing and made a speech in which he named himself a patriot and said he had acted within the constitution when he declared a state of emergency. "I am being called a traitor, I have been chief of army staff for nine years and I have served this army for 45 years. I have fought two wars and it is 'treason'?" he told the court. 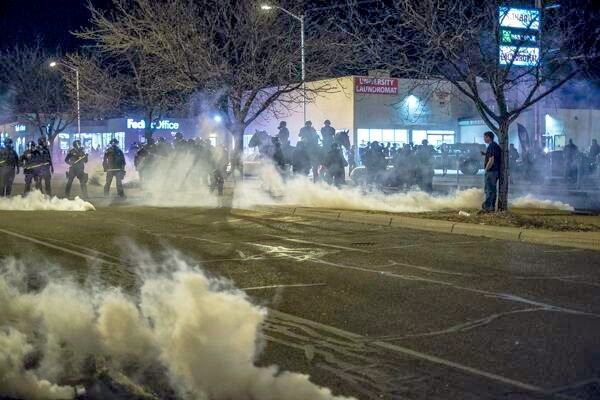 Albuquerque police have violently cracked down on protesters, using tear gas and arresting several demonstrators, after over nine hours of unrest. Hundreds expressed their anger over last week's police shooting that saw a homeless man killed. At the beginning of the rally, protesters asked police to take responsibility for their actions. “The police serve us, they do not kill us,” one protester told the local KRQE media outlet. However, another activist stressed that the rally wasn’t about hating police, rather about standing up for injustice, as he spoke through a microphone to others in the crowd. At some point the protest turned violent, as some activists spray-painted property and took down a street sign, and police in riot gear began using tear gas after a stand-off between security forces and demonstrators. The protesters are outraged over the fatal shooting of a 38-year-old homeless man, who was caught illegally camping in the Sandi foothills. James Boyd, thought to be schizophrenic, was shot by the Albuquerque security forces just over two weeks ago after he became engaged in an hours-long standoff with officers. A week after the incident, a video emerged online showing a cop opening fire on Boyd while his back was turned to the police. 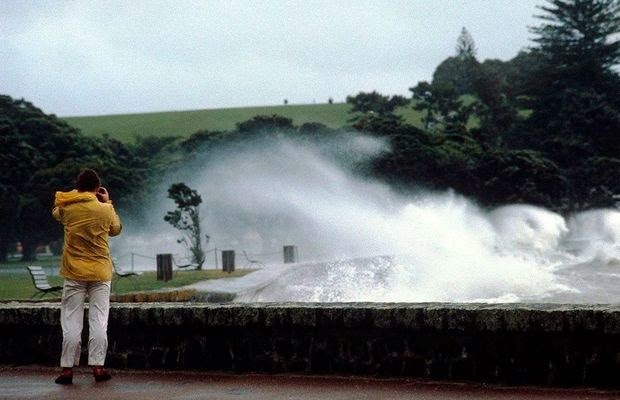 Wildfires, more frequent and severe floods, and higher risks to coastal infrastructure due to rising seas are just some of the impacts New Zealanders can expect from climate change in the coming decades. The report is the second part of the IPCC's Fifth Assessment, the most comprehensive assessment of the world's vulnerabilities to climate change, and it warns that adapting to future impacts in this region could mean having to translocate industries and giving up on protecting certain areas from sea level rise and excessive heat. Wildfires are expected to cause damage to settlements and ecosystems, economic losses and risks to human life in many parts of New Zealand as a consequence of drier and warmer conditions. One of the lead authors for the report's chapter on New Zealand and Australia, NIWA climate scientist Andrew Tait, says wildfire is already a major issue in Australia, but New Zealand now also faces a higher risk. "Large areas of the country which have traditionally not been high-risk areas, Southland and Waikato for example, due to a warming environment leading to more evapotranspiration and a drying of the soils and the vegetation are going to be more at risk from wildfires as we move through the century." Droughts will be more intense. The chapter's coordinating lead author, Agricultural Greenhouse Gas Research Centre deputy director Andy Reisinger, says wildfires could be more destructive in New Zealand's as our native forests are not adapted to it. "The other point is of course that much of how New Zealand has dealt with rising greenhouse gas emissions so far was to plant forestry that absorbs carbon from the atmosphere, and it's ironic that there's now a rising risk in releasing such stored carbon in wildfires." Rainfall predictions for New Zealand are for more rain in the south and west, and drier conditions in the north and east. Andrew Tait says the main pattern is associated with a likely change in westerlies over the country, which are projected to increase mostly in the spring and in winter. 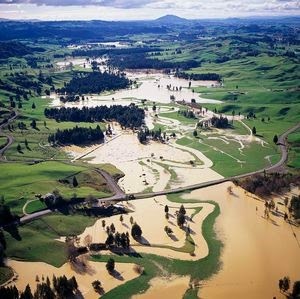 "Some of our large South Island catchments have their headwaters in the Alps where we are expecting mean rainfall and the extreme events associated with warmer temperatures to increase, leading to larger floods, in the order of 5 to 10 per cent larger by the middle of the century, to what we've been used to in the past." The Waikato's Waipa River flooding below Te Kuiti. Sea level rise is expected to reach about half a metre by the end of the century under low-emission scenarios, but Dr Reisinger says even that will be a challenge for New Zealand, with most of our cities and infrastructure built on flood plains and near river mouths. "There is scope to adapt but it would require what we call transformative adaptation, which simply means giving up protecting everything but deciding that some areas cannot be protected and we have to think about shifting some communities away from the coast over time. And that would mean major social upheaval." However, there will be some benefits from climate change for New Zealand. Warmer winters will mean lower heating bills and might reduce winter illnesses, forest growth is expected to increase, and some parts of New Zealand can expect stronger spring pasture growth. 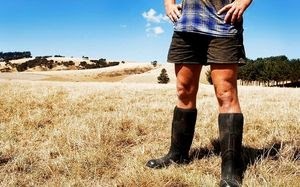 An increase in heat waves, constraints on water resources and loss of agricultural production represent three risk areas that apply to both countries, but will have a more immediate and more damaging impact in Australia. For example, the Murray Darling Basin could lose 70 per cent or more of its current food production on a regular basis towards the end of the century. Two other key risks - the loss of montane ecosystems and changes to the structure of coral reefs - apply only to Australia. Regional average temperatures in this region have already increased by 0.9 degrees over the last century, and sea levels have risen by 20cm - and the report predicts this will continue. "It's virtually certain that the region will continue to warm throughout the 21st century and there the projected changes are between 1.5 degrees more for the most stringent global scenario for reducing greenhouse gas emissions up to more than 4 degrees warmer than at present," says Dr Reisinger. 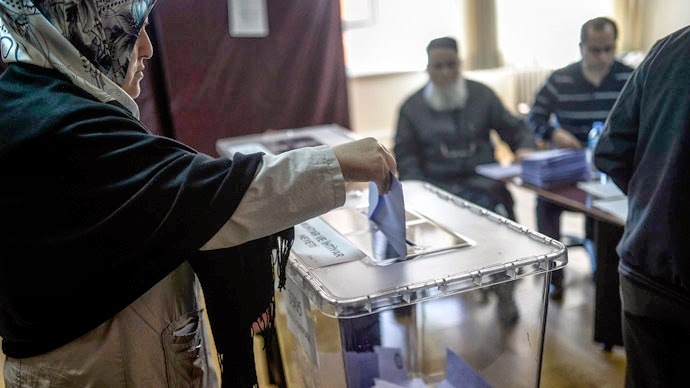 Mainstream media is reporting that 8 are dead and 18 wounded in clashes over the election in Turkey today, although the exact circumstances remain unclear. Power outages are reported in over 40 cities across Turkey. The power outages started as election ballots were being counted. Journalists and election monitors report being refused access to film or observe the ballots being counted at several counting stations. There were also reports and photographs of overwhelmingly opposition party marked ballots being burned and discarded in the trash. Burning ballots is part of the normal procedure for a contested ballot; however, reports are that mainly opposition party ballots were burned and way more discarded ballots were discovered than the official contested ballots number. There are also reports that AKP party members surrounded vote counting stations in Istanbul. Later reports on Twitter allege that AKP party members attacked the Today's Zaman newspaper headquarters (alleged to be controlled by Gulen). Photo is of current reported power outages in Turkey. Climate scientist Prof. 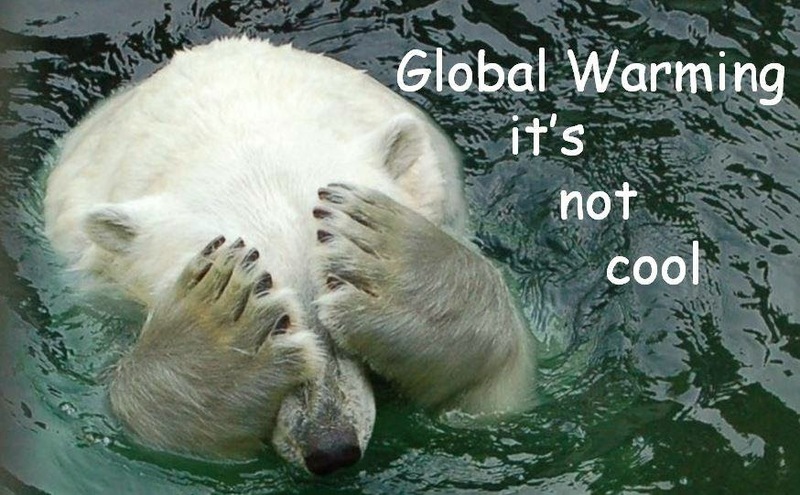 Guy McPherson chats to UK Collapse Radio Show to discuss climate change and what the mainstream media are failing to tell us. Guest Richard Heinberg, Senior Fellow at The Post Carbon Institute in Santa Rosa. Richard is an old and cherished friend. We have walked together for more than a decade on the road of Peak Oil and Peak Resources. Richard is the author of many books who has spoken all over the world to a wide section of audiences, including Prince Charles. He is a supremely accomplished and modest man. No matter what you thought you knew about Rich, there are many amazing things about him that you have probably never heard before, but you will tonight. His latest book “Snake Oil” pulls no punches about the dangers – and the economic folly – of fracking. But we are going much deeper than that as elders, looking back on more than ten years of telling people about the world we live in today. We will pay tribute to those we have walked with, those who taught us, some of whom are no longer with us We will share from our hearts in these poignant moments as industrialized civilization continues it accelerating march towards into history. Pravda.Ru would like to bring to your attention "The Unknown Putin" - a documentary by well-known Russian journalist Andrei Karaulov. The first part of the film is devoted to the struggle for oil, which was unfolding during the first presidential term of Vladimir Putin. There were a lot of serious, yet unknown incidents that occured during that struggle. Andrei Karaulov formulated his idea of the documentary as follows: he wanted to understand what Putin had to experience from 2000 till 2010. The story of five attempts on Putin's life. The story of the struggle for the Russian industry, which was practically destroyed by privatization. How could Russia lose the power of the Soviet defense industry in just a couple of years? The answer to this and many other interesting questions can be found in Part II of this outstanding documentary. An earthquake in Calfornia shook residents and brought rides in Disneyland to a standstill as more than 100 aftershocks rattled the US state over the weekend. 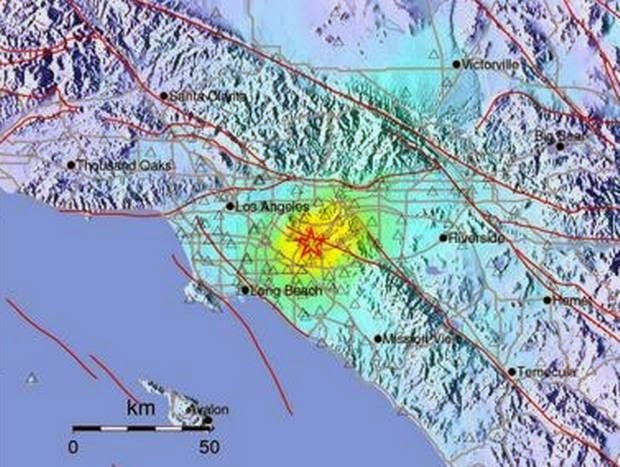 Residents of southern California were rattled by a 4.1 magnitude earthquake yesterday afternoon, the largest of scores of tremors following Friday's 5.1 rumbler that caused light scattered damage around the Los Angeles area. Saturday's quake rippled through an area near Rowland Heights, California, according to the U.S. Geological Survey. The temblor was considered relatively shallow with a depth of 5.6 miles, the USGS said. Aftershocks are expected following earthquakes, according to the USGS. Seismologists said there was about a 5 percent chance that Friday's quake, which struck at 9:09pm local time was a foreshock to a bigger quake. As well, a water main break in the city forced the closure of some streets due to flooding, he said. The quake also shook items off tables, rattled chandeliers and resulted in scattered damage to cars and property, including setting off a rockslide in the Orange County city of Brea that flipped a car on its roof. While not large, the event “seems unusual, of course, because a lot of people felt it,” said Doug Given, a USGS geophysicist. “These quakes occur in populated areas and people try to put two and two together and predict that something more is coming, but that's simply not the case,” he said. “The L.A. Philharmonic should get combat pay,” audience member Michael Healy told the newspaper. The word dollar didn’t even come up. “The volume of transactions that can be carried out in the Chinese currency in international and German financial centers is not commensurate with China’s importance in the global economy,” the Bundesbank explained in its dry manner on Friday in Berlin, after signing a memorandum of understanding with the People’s Bank of China. President Xi Jinping and Chancellor Angela Merkel were looking on. It was serious business. Everyone knew what this was about. No one had to say it. The agreement spelled out how the two central banks would cooperate on the clearing and settlement of payments denominated in renminbi – to get away from the dollar’s hegemony as payments currency and as reserve currency. This wasn’t an agreement between China and a paper-shuffling financial center like Luxembourg or London, which are working on similar deals, but between two of the world’s largest exporters with a bilateral trade of nearly $200 billion in 2013. German corporations have invested heavily in China over the last 15 years. And recently, Chinese corporations, many of them at least partially state-owned, have started plowing their new money into Germany. As a world payments currency, the renminbi is still minuscule but growing in leaps and bounds: in February, customer initiated and institutional payments, inbound and outbound, denominated in RMB accounted for only 1.42% of all traffic, but it set a new record, according to SWIFT, the NSA-infiltrated, member-owned cooperative that connects over 10,000 banks, corporations, the NSA, and other intelligence agencies around the world. Despite China’s heft as the second largest economy, the yuan was only in eighth place as payments currency, behind the Swiss franc. The dollar and the euro have been duking it out over the top spot. In February, the dollar accounted for 38.9% and the euro for 33.0% of all payments traffic. January last year, for example, the euro was in first place with a share of 40.2%, while the dollar only came up with 33.5%. As China moves away from the dollar, its share as payments currency will continue to drop. Setting up Frankfurt as an offshore renminbi trading center has been in the works since 2012. A steering committee was set up in July 2013 that included the Economics Ministry of the state of Hesse, the Federal Finance Ministry, and the Bundesbank. In October 2013, the “RMB Initiative Group” – which included the four Chinese banks with a presence in Frankfurt, German financial services giants, and the Bundesbank – met for the first time. The working group that deals with the establishment of the RMB clearing solution is headed by the Bundesbank and counts SWIFT among its members. German corporations and trade associations all support the initiative. It was “a major step forward in intensifying Germany’s economic relations with China,” said Bundesbank Executive Board Member Carl-Ludwig Thiele. A succinct definition of breaking the dollar’s hegemony as payments currency, investment currency, and reserve currency – China’s strategy since 2009. At the time, the financial crisis in the US sent cold shivers down the spine of China’s government that until then had been sitting loosey-goosey on mountains of US paper that suddenly threatened to evaporate, such as Fannie Mae’s and Freddie Mac’s mortgage backed securities that China had somehow thought were worth something when in fact they were not – at least not until China applied enough pressure on the Bush Administration to guarantee them and on the Fed to buy them to inflate their value. 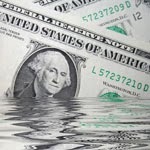 China got bailed out by the US taxpayer and the Fed, but the episode taught the government a lesson: dump the dollar. And so it went about it, carefully, systematically, step by step, but relentlessly, as Xinhua said, in a “multi-pronged” strategy that included making broad-ranging bilateral currency deals with one country at a time. 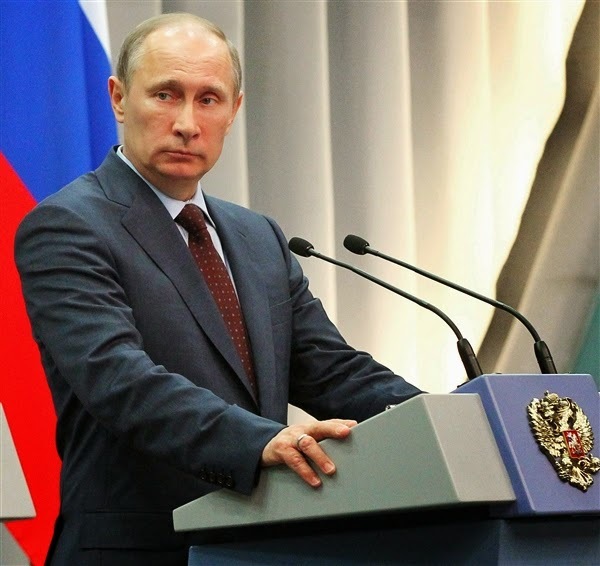 Compared to China, Russia is small fry in terms of trade and financial relations with the US. But it too has had it. The first official warning shot was fired before its all-out assault on the dollar system begins. Not by a Putin advisor that can be brushed off, but by Russia’s Minister of Economy and former Deputy Chairman of the Central Bank. A major escalation. It is one of the most polluted countries on earth. 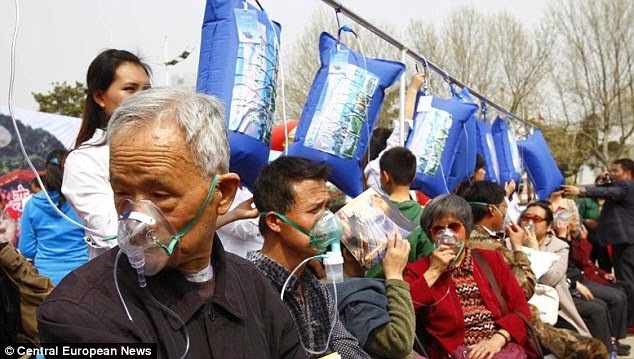 So it may come as little surprise that the latest fad in China is literally offering its city dwellers a breath of fresh air. 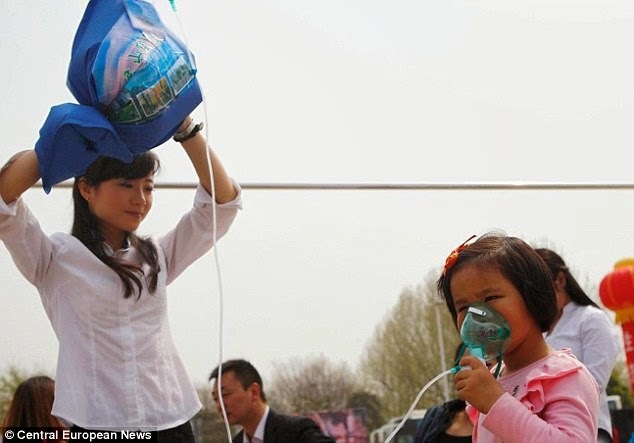 Numerous fresh air stations have been set up in some of China's most polluted cities. The stations are stocked with individual air bags which provide users with pollution-free fresh air. And they have proved to be a big hit with one air station in Zhengzhou city in central China's Henan province which was inundated with visitors. Uniformed air hostesses hook up visitors to oxygen masks so they can breathe air sourced from the Laojun Mountain scenic spot in Luanchuan county, which is 80% green land, in Henan province. There was no shortage of takers as locals flooded to enjoy the free fresh air. The air bags are China's latest attempt to address its dangerous smog levels - described as an environmental crisis by the World Health Organisation - after canned and bottled air already hit the streets. The air stations follow on from last week when costumed characters called Oxygen Babies were giving away air bottles filled with air collected at the Tianmu mountain scenic spot in the county of Linan in Zhejiang province. The Oxygen babies have been touring the country, promoting the new products, which are currently free of charge, and were pictured in the city of Hangzhou in east China's Zhejiang province. But in Laojun, where the air bags are being distributed, park managers say the average negative oxygen ion is 30,000 per cubic centimetre. In some places on Laojun Mountain, the average negative oxygen ion can be 50,000 per cubic centimeter. The inspiration for the idea reportedly came from tourist shops near Mount Fuji in Japan, where cans of fresh air have been a huge success. However, it's not the first time bottle air has gone on sale in China. Last year, Chen Guangbiao, who made his fortune in the recycling business and is a high-profile philanthropist, claimed to have sold 10 million cans in just 10 days, as pollution levels reached a record high. The move comes after the country's biggest online travel agency and insurance firms joined forces to offer policies to tourists whose trips are blighted in being visually impaired by the pollution. From 1975 to 2008, the US Geological Survey found that central Oklahoma experienced one to three 3.0-magntitude earthquakes per year, The Nation reported. That number jumped to an average of 40 a year from 2009 to 2013. The state has received 25 such quakes this year, and 150 total quakes just this week. Overall, the entire state of Oklahoma has experienced 500 earthquakes of any magnitude since Jan. 1. Scientific data suggests the current fracking boom is a major part of the spike. Fracking is the highly controversial process of injecting water, sand, and various chemicals into layers of rock, in hopes of releasing oil and gas deep underground. Fracking has long been associated with seismic activity, as researchers have shown connections between quakes and wastewater injection wells. The toxic wastewater is stored deep underground, causing friction along fault lines, scientists have found. For instance, researchers last year linked drill sites to a series of quakes in parts of Ohio. 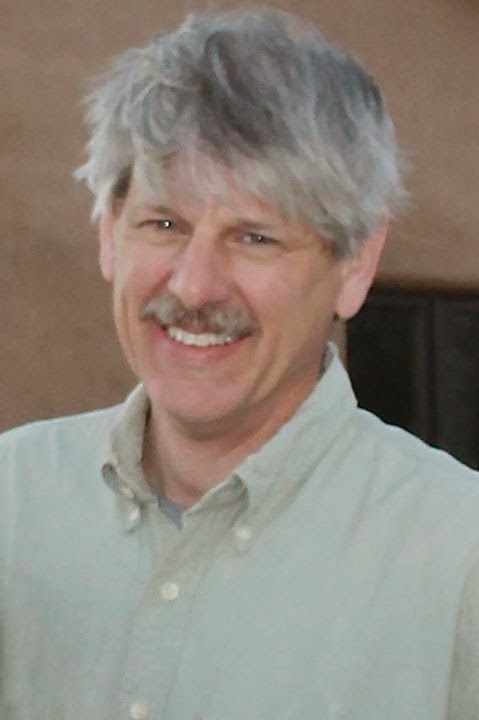 The injection wells used for oil and gas development are the “most reasonable hypothesis” to explain the earthquake uptick in Oklahoma, Nicholas van der Elst, a post-doctorate research fellow at Columbia University’s Lamont-Doherty Earth Observatory, told The Nation. “The burden of proof is on well operators to prove that the earthquakes are not caused by their wells,” van der Elst said. One 2011 study, published in the journal Geology, linked liquid infusion with earthquakes in the state, including the largest ever recorded in Oklahoma. The state has over 4,400 disposal wells, StateImpact reported. The Nation found that the seismic action associated with fracking wells are getting notice in state legislatures. Arkansas has banned wells in one 1,550-square mile area based on quakes there. Ohio has banned wells near fault lines, and a task force was assigned by the state of Kansas to assess links between quakes and fracking. 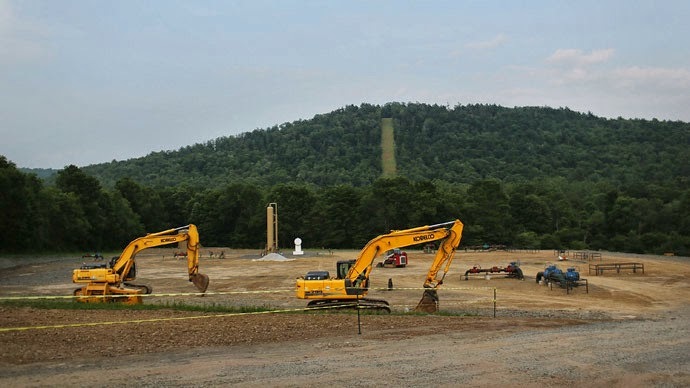 Vermont has banned fracking, despite negligible prospects for oil or gas production, and Massachusetts is seriously considering a ban. Five Colorado cities have prohibited fracking, though they face legal challenges from the state – not the industry. And the city of Dallas passed late last year restrictions that prohibit fracking within 1,500 feet of a home, school, church, and other protected areas, effectively banning the practice within the city. One town in rural Texas has taken to demanding that regulators act immediately to ban fracking in their area, as they allege that it is to blame for a spate of recent earthquakes. 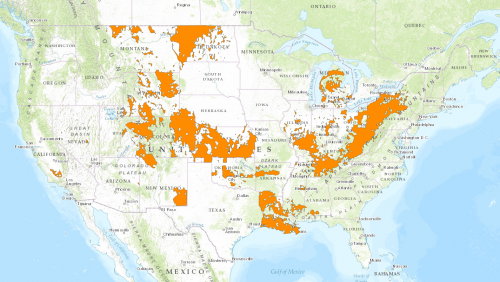 Meanwhile, a recent report found that some of the most drought-ravaged areas of the US are also heavily targeted for oil and gas development using fracking, a practice which exacerbates water usage. In California, 96 percent of new wells are located in areas where competition for water is high. A drought emergency for the entire state – which has traditionally dealt with water-sharing and access problems – was declared last month. Fukushima radiation in NZ ecosystem?